Left to right: Donnie Ghawan Haith, Shannakay Powell-Lombard, Leah Clark, Charlotte Cox, Daniel Taylor, Rachel Mashburn, Heather Middleton, Jacqueline Morales-Maldonado, Crystal Ann Dugan, Cassandra Guzman, Lauren Elizabeth Webster, Isaac Johnson, Megan Smithey, Annamarie Alexia May, Estefany Guerrero, Cayce Cleghorn, Laura Brown Ingram, Nicholas Wolcott, Caleb Watson, Lindsey Crites, Alecia Dunn, Bertha “Bert” Hyde, and Tierra Locklear. 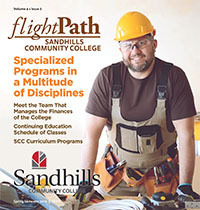 When Jon and Jackie Giles approached President John Dempsey three years ago about the need for a leadership academy for Sandhills Community College graduating students, little did they know it would become a highlight of the spring term. 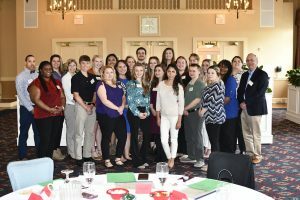 On April 5, the St. Andrews Room at Pinehurst Country Club hosted the third graduating class of The Giles Student Leadership Academy. Students received certificates marking their completion of a day-long engagement with local and regional leaders who spoke on topics ranging from ethics and fear to public service and civic engagement. Themed around the Mark Twain observation, “They did not know it was impossible, so they did it,” the 25 student participants engaged in sessions designed to promote the possibility of success and leadership that lies within each human being. SCC Director of Student Life Shenika Ward and Derrick Drakeford, a motivational expert in purposeful living, conducted morning sessions on self-awareness and self-actualization. Afternoon sessions by Habitat for Humanity Director Amie Fraley and Gryphon Group CEO Michael Vaden included messages on work-life balance strategies and separating myth from realities in rising to a leadership role. The Giles husband and wife team, longtime supporters of the college, shared with the group that such lessons come from life more often than they come from classroom experience and noted that hearing from proven leaders can steer others toward both the success and the sense of obligation to others that come with the leadership role. Invited scholars were nominated by program coordinators and department chairs from all academic disciplines.